There’s nothing more satisfying than an indulgent scoop of ice cream on a hot summer day. And it’s even better when you’ve whipped up your own homemade creation. Brian and I don’t make nearly enough in our house, even though the bowl for our ice cream maker is always frozen, always ready to go. This past weekend we FINALLY checked the activity off of our to-do list and man, I have no idea why we waited so long! The creamy blend we put together wasn’t difficult, or even that time consuming to make. And the best part: We have enough creamy goodness to last us for days! We started out with a classic base and dressed it up a bit with flecks of dark chocolate and vanilla bean. The addition of some strawberry simple syrup (leftover from another project) and tiny pieces of fresh strawberries made sure that every lick of this decadent treat was one we’ll remember. 1. Combine the heavy cream, whole milk, 1/4 cup sugar and salt in a saucepan. Split the vanilla bean lengthwise down the center and use a knife to loosen the seeds. Add both to pot. Heat over medium and bring to a simmer, stirring occasionally. Once sugar has dissolved, remove from heat, cover and let sit aside for 30 minutes. 2. In a medium bowl, whisk together the egg yolks and remaining sugar for about 2 minutes or until pale. Gradually add 1/2 cup of the milk mixture to the eggs and stir to combine. Add 1/2 cup more and combine. Now pour the yolk mixture into the pot with the remaining milk mixture. Heat over medium, stirring constantly, for 2 to 3 minutes or until mixture becomes thick enough to coat the back of a wooden spoon. Strain custard into a medium bowl and refrigerate until chilled. 3. Once chilled, pour custard into an ice cream machine and churn until nearly finished. 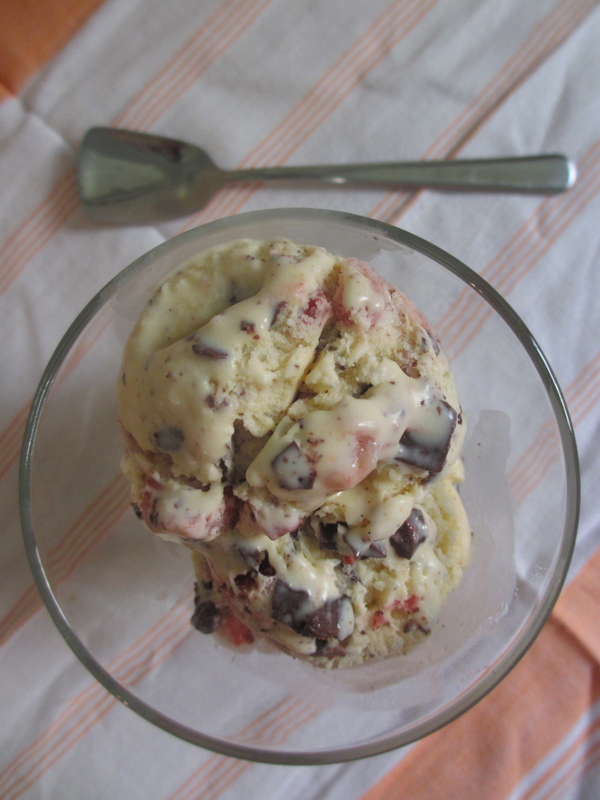 Once you think you have about 5 minutes remaining, add the strawberry simple syrup, chocolate pieces and fresh strawberry and continue to let the ice cream maker do its thing. When complete, transfer to a freezer-proof container and freeze for 2 to 4 hours or more. °Sorry, mom! 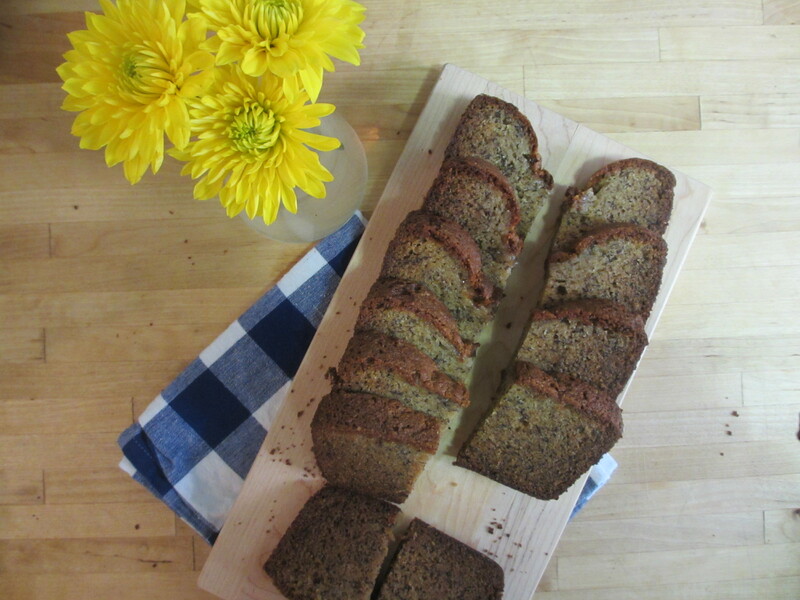 I don’t know how to tell you this, but I’ve fallen for a new banana bread recipe. It’s not that I don’t like yours, I love it! In fact, I still expect you to make a loaf or two (or four) every time I’m visiting because it feels like home. But when I’m making my own batch, I’ll be following a different recipe. While flipping through the latest issue of Bon Appetit I spotted a familiar green hut, Julia’s in the village of Kahakuloa on the island of Maui. Three years ago this May I was standing in the very spot pictured in the magazine, sampling the still warm bread. I’ve thought about the dense, sweet bread frequently since my trip and thought the only way I would get another bite would be to go back. While I’m sure Julia has her own special touch (probably the extra sweet bananas that grow on the island), this version is a close second. 1. Preheat oven to 350°F. Coat a 9x5x3″ loaf pan with cooking spray or vegetable shortening and set aside. 2. In a large bowl, combine the bananas, eggs, sugar and oil. Set aside. 3. In a medium bowl, whisk the flour, baking soda and salt together. Add the dry ingredients to the banana mixture and stir until just combined. 4. Pour batter the into prepared pan and bake for 60 to 70 minutes or until a tester inserted into the middle comes out clean. Transfer to a wire rack and let cool in the pan for 15 minutes. Run a knife around the inside of the pan to release the bread, turn out onto the wire rack and cool completely. SWWU Tip 1: Bananas going bad? When they start to turn, stash them in your freezer. We always have a few on hand. To defrost, just move to the fridge the day before you want to use them. They’re great for smoothies, muffins and of course, banana bread. SWWU Tip 2: We’re looking forward to adding our own twist to this recipe. For a different flavor, add 1/2 cup semi-sweet chocolate chips or 1/2 cup roughly chopped walnuts.